The book opens with a child on the Dominator homeworld who gets a brutal lesson in class about the importance of recognizing one's own faults in order to better overcome them. He carries this with him throughout life and eventually becomes the leading Combat Technologist, and it is through his striving to improve a race that already sees itself as nothing but perfect that the super-soldier Dominator warriors were created. We then get two brilliant tie-ins, which may be among the coolest in recent memory. Going way back to the "Invasion" crossover from the '90s, the Dominator defeat at the hands of Earth's heroes left them scarred and isolated. Eventually the Dominators signed a treaty with Earth and all was quiet and peaceful for a while... until Booster Gold showed up and stole an experimental weapon from them because he had "52 worlds to save"! The Dominators saw this affront by a human as breaking the treaty, and slowly began destroying Earth outposts, one of which is where they created the virus that infected every artificial intelligence on earth. The United Planets could not retaliate against these clandestine attacks, or they would actually be breaking the treaty openly. And so they sent Mekt and his Wanderers to try and handle the situation quietly. It was after one of the battles with the Wanderers that the Combat Technologist realized the fluke in human DNA that allowed for some to have meta-human powers, and that was what gave them the edge in battle. Thus his plan to genetically engineer super soldiers was born. The Combat Technologist is also holding Sun Boy and his team prisoner and was possibly experimenting on them. He then lets Sun Boy and his team go, to join with the Legion and Wanderers in the battle outside, which it's clear he believes will help tip the scale in their favor. The genetically enhanced Dominator in the room attacks him, believing (as most other Dominators do) that they are perfect and beyond flaw. The Combat Technologist accepts his fate as being part of the price he must pay to help his species grow. He believes the Dominators will lose and the super soldiers will be scattered through the universe, where they will pass down their modifications to future generations, providing for a much stronger, more powerful race of Dominators. Outside, Sun Boy and company join with Cosmic Boy and the Legion and Mekt and the Wanderers, and they prepare for their strike to take the entire planet down. Story - 5: It is strange, to me, that Mark Waid got not even a story credit on this book. I am willing to give Tony Bedard all due credit for this issue, but it so clearly ties in to basically every aspect of the story Mark Waid has been weaving that I don't see how you can't credit Waid for his contribution. Without the story Waid's been telling, this issue couldn't exist. That point aside, what this issue lacked in terms of pretty much ANY Legion involvement or character moments it more than made up for by tying so many stories from past Legion issues together, and then going a step beyond and tying into 52 and having Booster Gold inadvertently be the cause of the entire Dominator invasion. The topper was tying the story into "Invasion" from waaaay back a decade ago, and having it be relevant to the story in such a way that if you didn't know better, you'd think that when the "Invasion" crossover was written they planned for it to lead to this moment over a decade later. That, my friends, is some amazing writing and is just something to behold. I wasn't a huge fan of Bedard's earlier influences on this book, but there were no problems here. This was an excellent issue made all the more amazing by the two big tie-ins. I especially liked the use of belief in self-perfection being one of the surest signs of lack thereof, and the strive to make yourself and your people better in the face of that, in a society that refuses to see itself for what it is because it's too wrapped up in its own vanity. Such a telling examination of much of humanity told through an alien race, much less one that is often portrayed as violent and evil, is one of the things that makes science-fiction the amazing thing that it is, and it's played absolutely perfectly in this issue. Art - 3: I waffled on this art a bit. Sometimes I thought it was great, sometimes average. It was hovering around a 4 until I got to the very last page of the issue, a splash featuring the Legion, the Wanderers and Sun Boy's team, the Terror Firmians. There is something seriously wrong with this page. The faces of nearly every person in the image are distorted and almost... warped. Supergirl's right arm looks broken and poor Light Lass flying in the background looks like her torso was turned to taffy and stretched on a rack, her neck was surgically removed, and then when they put her head back on they decided to smash her in the face with a frying pan a few times for good measure. 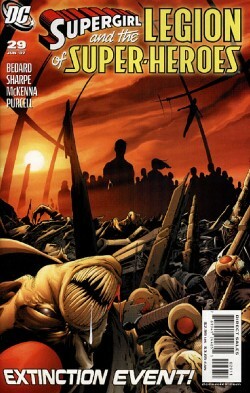 Cover Art - 4: Seeing Dominator Drool wasn't high on my list of "Gotta See More of This Stuff on Covers! ", but it's a strong image which speaks to all kinds of cool battles that we didn't really see. Regardless, it makes me think "I gotta pick this book up!" and for that, it does its job.